121 Stroud Green Road has been a cursed address for eateries. Over the past three years or so, the site has been home to a caff, a noodle bar, a fried chicken take away joint and a Turkish restaurant (where I once spied one of the owners crying into her hands). The long-windedly named Rub Slow Food Diner and Milk Bar is the latest tenant and offers a simple menu: Caribbean-style meat, milkshakes and New York-style cheesecakes. Rub feels like a cross between a student union bar and a Shoreditch squat. The threads strung between the bare lightbulbs look a little silly, while reprints of old movie posters line the walls and the tables are all decorated with musical themes (there are Bob Marley and Nine Inch Nails tables, for example). Rather than table service, you fill out a checkbox order form and hand it in at the till with your payment. Take a seat and wait for the food to arrive. The staff still need a lot of breaking in though – misreading order forms and bringing incorrect dishes was annoyingly common. I wasn’t expecting much from the pulled pork given that even dedicated barbecue restaurants in London have trouble producing an edible version. Rub’s version was far too dry and bland and the tame ‘extra hot’ sauce did little to revive it. At least the accompaniments of malty, lightly spiced rice and earthy, zesty leaves were pleasing. 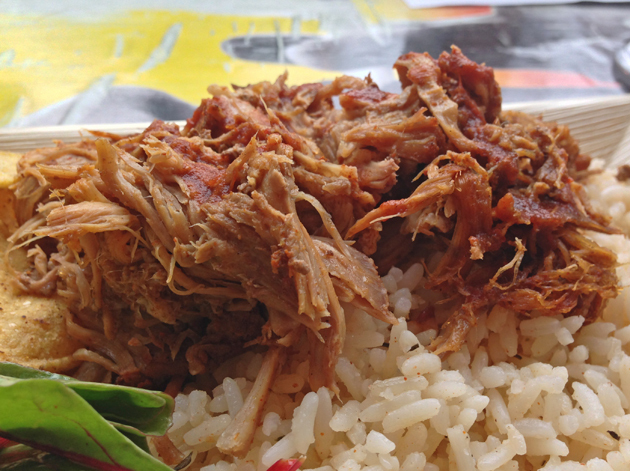 Far better than the tasteless pulled pork was the side dish of jerked beans. 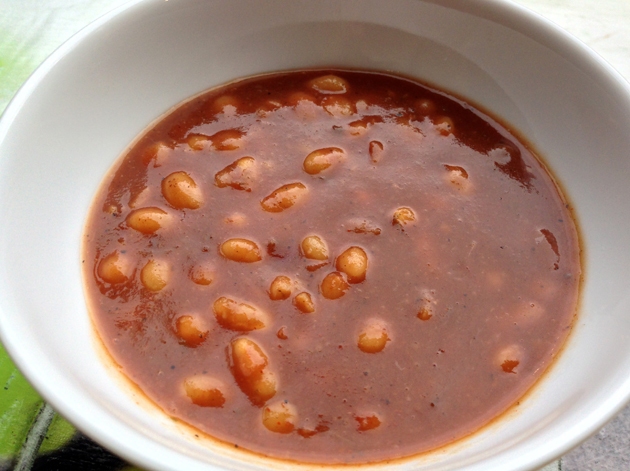 The soft, creamy beans came in a surprisingly hot and peppery scotch bonnet-based sauce. For a ‘slow food’ diner, the dishes come out at a rapid pace. 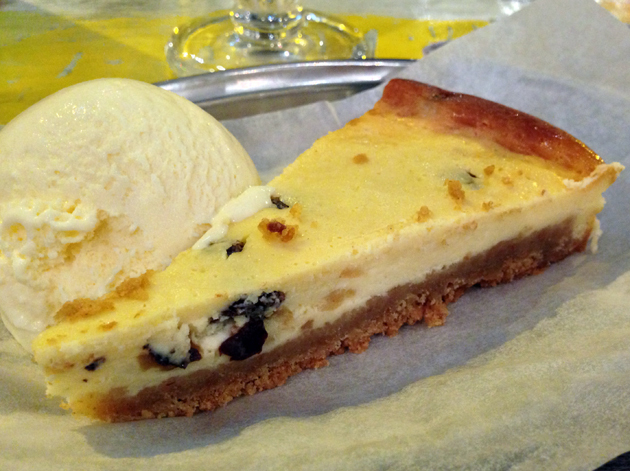 Despite the lengthy list of cheesecakes on the menu, typically only one or two are available on any given evening. The raspberry cheesecake was thick, dense and very creamy with a soft, crumbly biscuit base but the raspberry flavour was barely detectable. The accompanying vanilla ice cream was very muted too. Why is this metal plate so small? 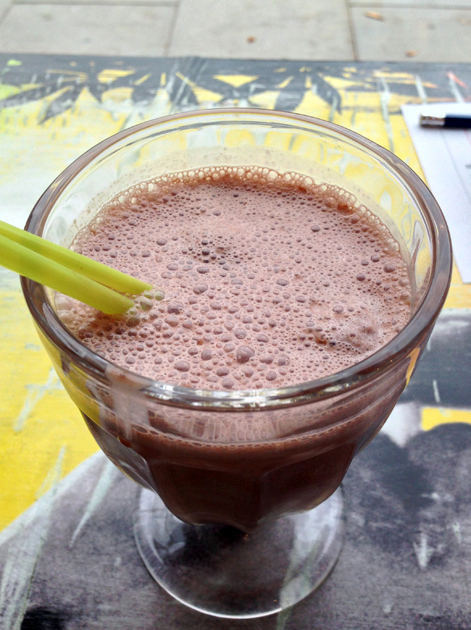 Although the chocolate milkshake was a bit on the small side and its thin milkiness won’t suit everyone, I did like the dark chocolatey taste. Rub-a-dub-dub, thanks for the grub? The limp pulled pork from my first visit has a poultry counterpart in the form of the jerked chicken. The bone-dry breast meat was only very lightly spiced. Lame. Why is the meat accompanied by nachos? Once again it was the side dish that was far more tasty than the meaty main. 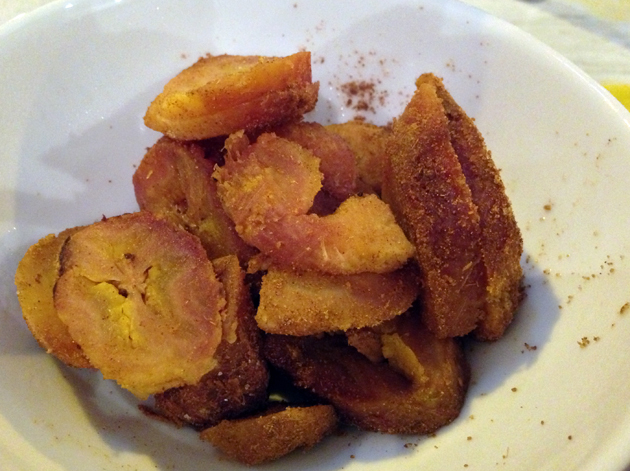 The roasted plantain slices were sweet and tender. Jerkmerica? What kind of email address portmanteau is that? 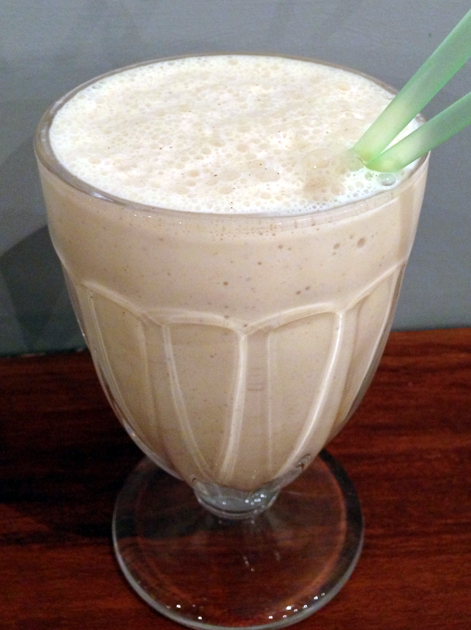 The peanut butter milkshake didn’t manage to replicate the viscosity of peanut butter, but its distinctly sweet and nutty taste was correct and present. I’m not satisfied until I hold you tight. 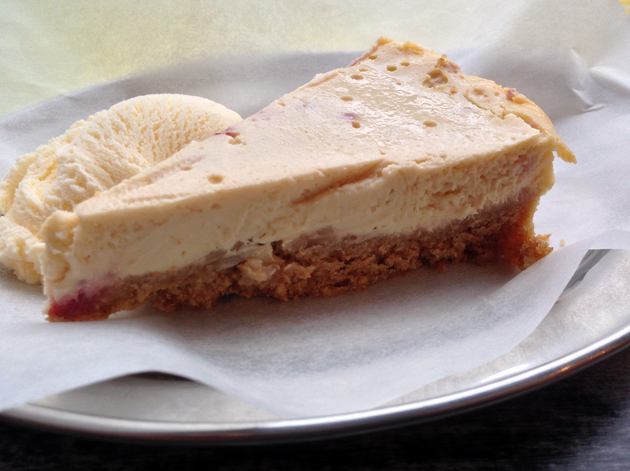 The rum and raisin cheesecake was very similar to the raspberry cheesecake from my first visit, except the muted raspberry flavour was replaced by a light hint of rum and the almost complete absence of raisin. The most successful meat dish I had at Rub was the pulled lamb. The tender strands of reasonably moist meat actually tasted of lamb which also had a mild fruity spiciness to it. The portion size was noticeably larger this time around, with the small but acceptable servings replaced by a heap of meat almost twice the previous size. Although I had ordered sauerkraut and pickle, I was served coleslaw by accident instead. 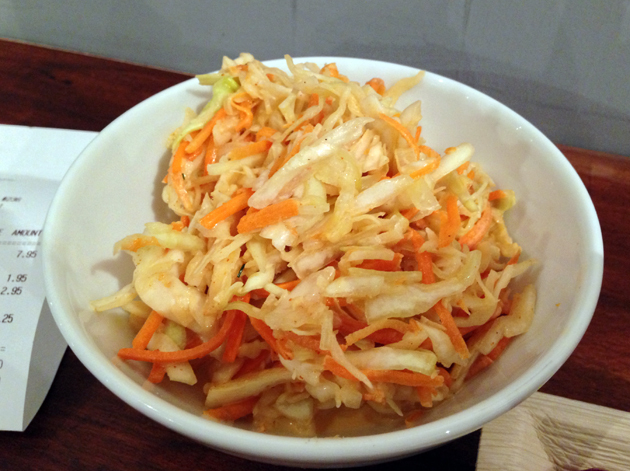 It was reasonably good as coleslaw goes – the heap of cabbage and carrot strips was sharp and not excessively creamy. Coleslaw does not count as one of your five a day. 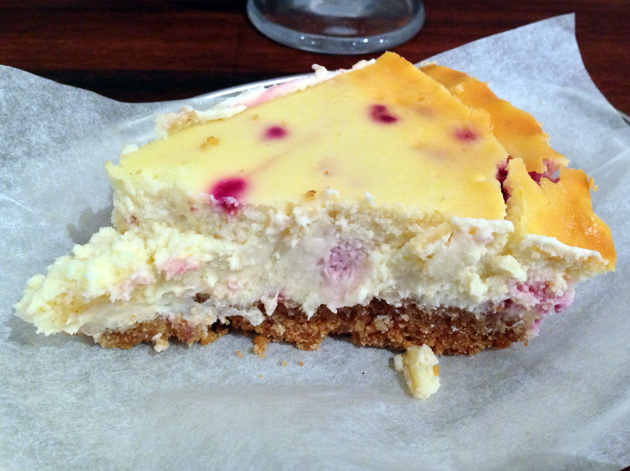 The only cheesecake available was once again raspberry, but it was a little different from its previous incarnation. It was lighter and less densely packed, but with a stronger taste of raspberries with a slight grittiness to it reminiscent of the actual texture of the fruit itself. The bolder taste of fruit was welcome, although it was a shame it came at the expense of the delightfully thick creaminess of the rest of the cheesecake. Washing it all down was the vanilla and toffee milkshake. The combined taste was addictive and reminiscent of caramel and malt. Stroud Green Road needs more good restaurants to serve the inhabitants of Hornsey, Crouch End and beyond, but Rub just isn’t good enough. The low prices, quality side dishes and milkshakes aren’t enough to make up for the generally substandard meat dishes and inconsistent cheesecakes. Opening Hours: Tuesday – Friday 18.00-22.00 and Saturday noon-22.00. Closed Sunday-Monday. Average cost for one person including soft drinks: £16 approx. 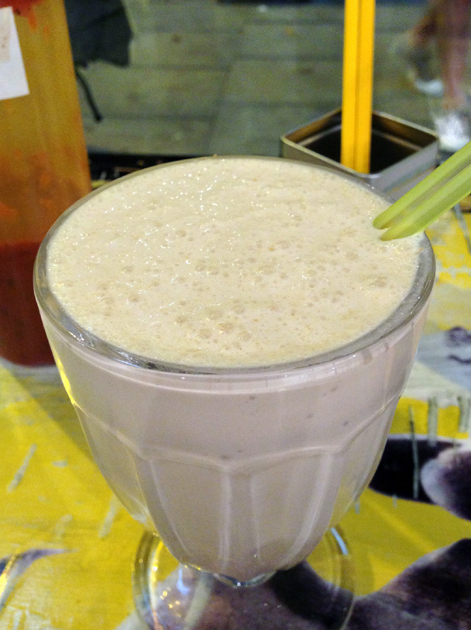 Tags: cheesecake, chicken, jerk, lamb, london, milkshake, pulled pork, restaurant, review, rub. Bookmark the permalink. Not really a fair review – they only opened a few weeks ago and could still find their feet. You should give restaurants a little longer before you completely destroy their reputation. If I had given Rub a positive review, would your objection still have been as vociferous? I doubt it for some reason. I think you’ve missed the point. Regardless of whether the review is good or bad, you should give the restaurant a bit of time to finds its feet before you review otherwise its totally pointless. Unless you’re dealing with exceptionally experienced operators, it’s unlikely that an establishment will launch to very high acclaim in its first few weeks of trading. Having been in the restaurant business before, I know that the first 3-6 months of trading are an absolutely vital learning process with many (if not all) things going wrong and a huge amount of rapid improvement needed. I’ve seen many restaurant which have had poor launches develop rapidly and turn into good – great local places. My point is that reviewing a restaurant so early on in its development process is unhelpful to everyone. Firstly, the likelihood is that your thoughts will go out of date very quickly and not be an accurate representation of the restaurant. Secondly, from the restaurant perspective, if you do give a bad review it may put customers off, forcing the restaurant to unfairly lose business before they find their full stride. If you insist of trying restaurants so soon after they open and you’re desperate to critique, I suggest that you send the owners a private note of your thoughts. Who knows whether Rub will become a success or not reach its potential, but for a truly useful review, I would advise giving the operator a few months to bed in. Thanks for your comments. This reply is lengthy and largely addresses your arguments in the order your made them. I haven’t missed your point at all, but was attempting to tease out what I see as a logical inconsistency in your stated argument using an ill-advisedly laconic expression of a counter-factual scenario. The scenario is this – if I had reviewed Rub positively, would you still have complained that I had reviewed the restaurant prematurely? Would you have criticised me for heaping plaudits upon them on the grounds that in a few months they would become even better or, conversely, that their short-lived brilliance was unsustainable and that their inevitable mediocrity would assert itself? I strongly suspect you would not have, but as this is a counter-factual scenario, it is of course impossible to say either way. Let’s put it another way. I recently reviewed three other restaurants shortly after they opened – Osteria Tufo, Grain Store, Picture – and those reviews were largely positive rather than negative. Why did you not choose to comment on those reviews, criticising my timing there? Did you agree with my opinions of those restaurants, but not my opinion of Rub? Are you personally involved with Rub in some way? Did I negatively review a restaurant that you were involved in? Or is it for some other reason? Or none of the above and that I should take your stated argument at face value? I don’t know. I am not totally unsympathetic to your stated argument that restaurant kitchens need some time to find their stride, especially as I have witnessed first hand the long hours, financial risk and almost unbearable stress inherent in opening a small business in the restaurant and catering sectors. However, restaurants need to find their feet very, very quickly given the competitiveness of the crowded London restaurant market. Your suggested time period of 3-6 months is far too indulgent. It would not be fair on paying customers, especially those that can only eat out occasionally, to have to put up with lacklustre cooking for such an inordinate amount of time. Especially as, in this case, Rub has an exceedingly small menu. Soft launches, pop-ups, residencies and private press previews (the latter of which I don’t participate in) are the appropriate ways of working out kinks in the kitchen – not on full paying customers. If one opens for business with the public, then one also has to be prepared for public criticism, both positive and negative. Without the aid of vocal inflections and body language I am unable tell with any certainty if your concern about the accuracy of my reviews is sincere or not, but it is unwarranted either way. Restaurant reviews, mine or anyone else’s, are by their very nature reporting of past events and not living documents – especially if the restaurant frequently changes its menu. My reviews bear their date of publication and, unless my proof reading skills have failed me, written in the past tense. I have also returned to restaurants and reviewed them again, both when the original review was positive and negative (Ten Ten Tei is an example of the former, Tapasia is an example of the latter). I may well re-review Rub, I may not. While I usually do not give any advance indication to a restaurant that they will be reviewed, Rub was a very rare exception. I emailed them to enquire about their opening dates a few weeks before they opened so they were well aware that they would be reviewed. In summary, I reject the specifics of your argument and I question your motives. I also stand by my review of Rub – both in its timing and in its accuracy. If you do eat at Rub, I am interested to hear your thoughts here. Firstly, it’s quite an easy argument to question my motives and imply that I am in some way affiliated with Rub. Well, all I can do is assure you that I am about as affiliated with Rub as you are with the businesses that you give good reviews to (hopefully this means ‘not at all’, but I won’t question your credibility if you will allow me mine). It’s important to mention that I was directed to your site for the first time via a local discussion group talking about Rub. It seems like a good blog, but unfortunately I had never seen any of your other reviews before. However, I will still answer your question. I think a positive review is a completely different beast to a negative one. A positive review inspires people to go to a restaurant. If the restaurant turns out to actually have a great offering, it can serve to fast track them to becoming a successful business. Should the positive review be inaccurate and the restaurant turn out to be not so good after all, they won’t have a great customer retention rate and their lack of business success will reflect their poor offering. Either way, a positive review hasn’t really affected much. A negative review on the other hand is not the same. As you should well know, a negative review can put people off even trying a restaurant. It can hurt and even destroy a business. If written by a respected enough opinion it can serve to blow away a restaurant’s business before they’ve even had a chance to find their feet. I concede that in modern day London 3-6 months is perhaps a long shot for the modern day restaurant. However, in my opinion, a reviewer looking to publish their articles publicly should to them the service of at least getting a month under their belts. Disappointed early adopter customers, if dealt with by the restaurant correctly with the right customer service, should not hurt business in the longer term. I think your point about your reviews being written the past tense and bearing the date on them is at best a little facetious and and worst a total misunderstanding of the industry in which you operate. Most of the Joe public who read this publication will not look at the dates and not think about the timings of it but allow it to directly affect their purchasing decisions. To insinuate that most people will read a very negative review, notice the date, and not allow it to affect whether they actually go to the restaurant or not is a somewhat deluded one. I’ve personally seen the direct business results of negative reviews and they are not pretty! At the very worst, you’re review will be ranked highly by Google, and every time someone type ‘Rub Stroud Green’ into the search engine, they will see two stars and ‘Rub just isn’t good enough.’ This could cause someone not even to bother trying out the restaurant without even reading the full review! I’m surprised that you’ve totally rejected most of my points. The main reason being is that I’ve now had a chance to look through most of your blog and actually some of the stuff you do is seriously considered and fair. The fact that you will often try a place a few times goes beyond what most reviewers would consider doing and allows you to look beyond an ‘off day’ in the restaurant. In the same vain you should really be careful about airing your public criticisms of a restaurant before they’ve had a chance to find their feet. You’ll do more damage than good to honest, local businesses. Personally, I’ll give Rub a try soon, but I’ll give them another month or so to bed in first. Will let you know my thoughts :-). This reply is tardier than I had intended. I’ll address a couple of ancillary issues, before moving on to what I think are the primary issues of contention here. Once again, this reply is quite lengthy. First, the ancillary issues. Questioning your motives was not an ‘easy argument’. In an attempt to give you the benefit of the doubt, to avoid making any unsubstantiated character attacks and to avoid making straw man arguments, my questioning of your motives was marked with what I had hoped was an obvious sense of qualification and uncertainty. The odd circumstances of your original comment led me to question your motives – an obvious and logical course of action which I’m glad to see was ultimately unnecessary. I frankly resent being accused of facetiousness. I made statements of fact and intention and I’ll repeat the fact in question once more – restaurant reviews are by their very nature a reporting of past events. My usage of date stamps and the past tense is a simple reflection and acknowledgement of this fact. The implications of this fact are clear – the more time that has elapsed between the original publication date and when a reader reads the review, the less likely the review will be able to serve as an accurate indicator of what to expect. Nothing short of a re-review can remedy this. All of this should be obvious. I am well aware that some readers will read reviews differently than others, but I cannot control how readers read a review. This should also be obvious. I think you’re greatly underestimating the ability of readers/diners to make dining choices of their own, regardless of what I think. Although it may well be a case of the vocal minority, I receive just as much feedback from readers vehemently disagreeing with my reviews, both the positive and negative ones, as I do from those concurring with me. To put it another way, the relationship between reviewers, diners and restaurants is not as simple as you would appear to believe – sometimes restaurants derided by critics will become wildly successful, while those praised by critics won’t. Other times, vice versa. Having said that, I am well aware of the potential negative consequences a review can have for a business. To the primary issues at hand. I don’t think Rub is very good, especially when compared to the competition. I wouldn’t recommend that my readers eat there and I have no hesitation in stating this opinion. I see no reason to give Rub any further benefit of the doubt. You, on the other hand, think that they should be given further benefit of the doubt based on the principle that restaurants need a grace period to work out kinks in their supply chain, cooking methods etc. I am sympathetic to this principle, but I think that Rub has exceeded any such grace period. The kitchen should have been able to master within two weeks of opening such a short menu consisting of just five main courses, five sides and often no more than two desserts, especially as the opening had been delayed. That they often could not raises serious doubts in my mind about their ability to cook to a consistently high standard over longer periods of time. I do not claim any sort of infallibility – it is entirely possible that I am wrong and you are right. However, I do not believe this to be the case. It is clear neither of us will be moved from our current positions. I do not agree with your position, but I do respect it and I had hoped that you would have returned the courtesy. I would pay another visit. They have a new chef and have changed the menu. How do you know they have a new chef? I went there the other day and it is well worth another visit. The two specials of French Dip beef sandwich and buffalo wings in particular were great. 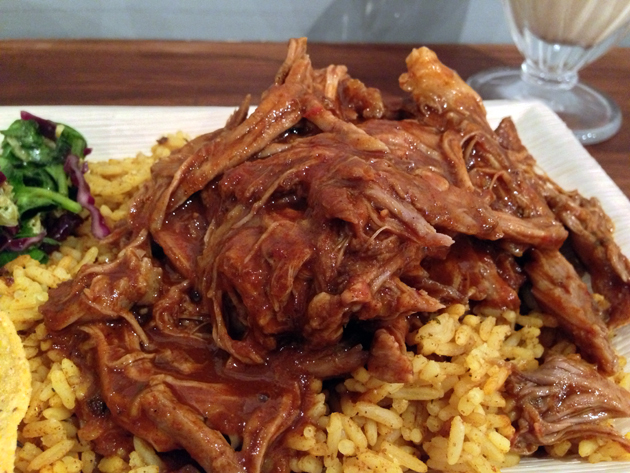 The pulled lamb was also full of deep, rich flavour- I thought it was much better than many more vaunted restaurants of a similar ilk, plus much better value. I went to Rub on Saturday 19th October. So a couple of months after this review was posted. And I think the reviewer has got it spot on. The portion sizes were very small. I ordered the BBQ pulled pork in a brioche bun. I was very disappointed with the amount of meat I got, regardless of the price. We also ordered chips to share, which was totally forgotten about in the order. My friend who I was dining with is a local and said he had bad service the week before but wanted to give it another ago. So it was no surprise when the chips failed to materialise – we didn’t bother to mention it as our waitress was not exactly friendly. The food I did have was decent, the pork was nice, BBQ sauce could have been tangier and sweeter but perhaps that is my personal preference. Good selection of beers. I was disappointed to see other diners being served Beaverton Smog Rocket. A beer I would have ordered if it was on the menu, at this point I was already drinking a Peroni. 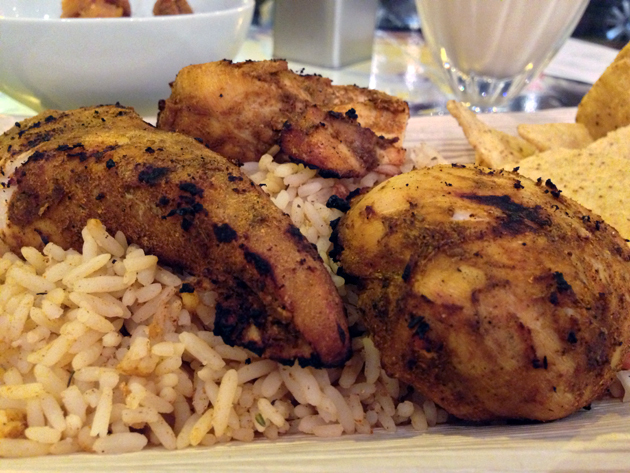 Overall I think Rub has great potential but needs time to address the service and the portion sizes. I will definitely be back in the next few months to see how they are getting on. The food itself is great value and I liked the atmosphere in there. Thanks for your comment, but I am largely baffled by it. You start out by saying ‘… I think the reviewer has got it spot on.’ Yet, you continue with ‘The food I did have was decent’ and ‘The food itself is great value’ – two statements that my negative review does not agree with. Unless you’re referring to someone else as ‘the reviewer’? I went to Rub a couple of days ago, and was really impressed. The burnt ends were some of the best I’ve had this side of the Atlantic (I’m American), and the pulled pork was pretty good. Fried pickles were proper American pickles, and the beer selection was great. It was also fantastic value. I’m a Stroud Green local, and hope that people aren’t put off by negative reviews- in my opinion it was really good food, decent staff, and a great price. What’s not to like? PS- I never got to pudding because the portion sizes were ENORMOUS! Either they’ve changed plate sizes or ‘picky glutton’ is an apt name? The burnt ends appear to be an intermittent special. I ate there last night, it was absolutely dreadful and I agree with everything in your review. To rate this place you need to have an extremely low benchmark for quality. The burnt ends were so dry they were inedible, the pulled pork was cold, the hot wings featured a marinade of neat hot sauce and chips were ‘old’. And lets be frank – this is not fine dining, all you need is decent marinades, a good oven and some care and attention. It is lazy and bland. Also you should not take in consideration the length of time a restaurant has been open when reviewing – what a ridiculous statement. Restaurants should be at their best when they open as they need to impress everyone who is going there for the first time. They should also have a team ready to perform and be as good as they can straight away, if they can’t then they shouldn’t bother opening. Every new restaurant is reviewed shortly after they open, the whole point being they get press and feedback and build their business. I really enjoyed my meal and the deserts were lovely. I’m so glad I didn’t listen to the reviews. I will definitely eat there again when I’m in the area. Arrogant and argumentative staff with no concept of customer service. Walked out due to poor service. It was empty on a Saturday evening and looks likely to remain so. Have seen this style of food done much better elsewhere (east London). It needs to die and vacate the space so that a worthwhile restaurant can occupy a spot on one of North London’s better eating streets.